The limousine President John F. Kennedy rode in fifty years ago today is an indelible part of our visual memory. That midnight blue Lincoln will be forever known as the setting of a national tragedy. Yet, after Kennedy's assassination, the car remained in service, transporting four presidents before it was retired in 1977. Aside from its association with the Kennedy assassination, the 1961 Lincoln Continental is held as one of America's most beautiful automotive designs. The slab-sided shape was refreshingly unadorned in comparison to the gaudy, finned, chrome-bejeweled excesses of the 1950s. It was modern, lithe—the automotive embodiment of President Kennedy's youthful image. Kennedy received his custom-built Lincoln Continental limousine in 1961. It was, with the benefit of hindsight, bafflingly unprotected. Code named X-100, the limousine given to JFK had been extended 42 inches, with a hydraulic rear seat that rose 10.5 inches for parades. It had flashing lights, retractable side steps for Secret Service members to ride on, and three removable roof designs. And no armor of any kind. Photo taken moments after President Kennedy was shot. Secret Service agent Clinton Hill, climbing into the vehicle, was behind Kennedy's vehicle at the time of the shooting. After Kennedy's assassination, X-100 was impounded for evidence gathering and a $500,000 revamp known as "Project D-2" or "Quick Fix." This included complete armoring of the rear passenger compartment, with blast proof panels in the floor and doors, and a permanent roof with bulletproof windows. But why resurrect a vehicle with such a heavy history? Historian Matt Anderson says timing and economics prevented the White House from ordering a completely new armored vehicle, which could have taken years to complete. Indeed, even in its first, unprotected iteration, X-100 cost nearly $200,000 to build—serious money at the time. The infamous vehicle would have to serve until new, armored limos could be built. In the "Quick Fix," President Lyndon B. Johnson personally called for the midnight blue X-100 to be painted black. It both acknowledged the assassination and distanced the vehicle from its own tragic past. And perhaps it was a personal fight against haunting memories: Johnson was in a car behind Kennedy on the day of the assassination, and anecdotes suggest he remained understandably uneasy around X-100 for the rest of his presidency. X-100 today, equipped as it was after the Quick Fix added a permanent roof and armor, on display at the Henry Ford Museum in Dearborn, MI. X-100 stayed in service for 14 more years, transporting presidents Johnson, Nixon, Ford, and Carter. During that tenure, some of the safety improvements were undone. In January 1967, "Project R-2" added mostly comfort changes, including roll-down bulletproof windows requested by President Johnson to replace Quick Fix's stationary glass. Later, President Nixon even ordered a flip-open roof panel so he could stand in full view during processions. President Nixon and wife Pat riding in X-100 during the January, 1973 inaugural parade. By this time, however, X-100 shared duties with purpose-built armored limos added to the fleet in 1968 and 1972. In early 1977, X-100 was retired to the Henry Ford Museum in Dearborn, MI, where it remains today. It's a fitting historical artifact, not just as the setting of the JFK assassination, but as the last civilian-grade automobile ever used by a president. The armored roof belatedly added to X-100 looked like an ungainly add-on plopped atop a Lincoln you might otherwise have seen on any 1960s American street. The presidential limos that came after it, however, strayed further and further from regular cars. Bush 1 and Clinton both rode in vehicles that outwardly resembled standard Lincolns and Cadillacs, but their bodywork hid one-off armored construction and heavy-duty truck running gear. By the time of George W. Bush's 2005 inauguration, presidential limos had become entirely custom-made machines bearing only a familial resemblance to production cars. President Bush's 2005 inauguration parade. The brand-new limo hinted at the design cues Cadillac would incorporate in its lineup starting in 2006, but it did not share any bodywork with production vehicles. Today, President Obama rides in a huge, heavily-armored limo nicknamed The Beast. Like the vehicle built for George W. Bush, it's a true specialty vehicle sharing only a handful of design cues with production Cadillacs. Viewed on its own, The Beast has the proportions of a standard, if somewhat burly, sedan. There's an interesting bit of trompe l'oeil going on here: built on commercial heavy-duty truck-running gear, The Beast is massive, standing taller and wider than most large SUVs. 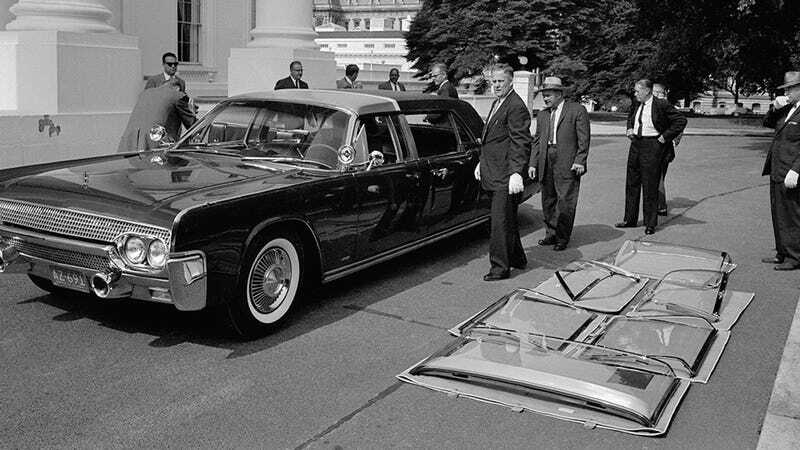 With eight-inch-thick doors weighing as much as the hatch on a Boeing 757 and five inch-thick undercarriage armor, The Beast represents the true state-of-the-art of presidential motorcade protection, a field launched by a tragedy that happened fifty years ago today. Looking at the somber, hulking limo President Obama rides in, it's hard to imagine a time when our nation's leaders were transported any other way. All images: Associated Press. Opening image: Kennedy's limousine delivered to the White House, June 14th, 1961. The roof on the vehicle could be removed and replaced with the clear plastic parade roof shown alongside.